The 405 got their hands on some preview code for Ambient Studios god (or should we say death?) sim, Death Inc. The design studio responsible for Death Inc. faced a set-back in February of this year when their Kickstarter funding scheme failed. Ambient Studios found another income stream to boost their budget, charging gamers for access to the alpha test version of the game. This tactic means that they have created their own crowd sourced funding arrangement. Providing investors with an alpha and not a demo means that they effectively charge customers to test their product, which is a very cunning move indeed. The good news is that the early investment gives you access to the full game when it is completed as well as other rewards. There are several tiers of donation between $10 and $5000 each giving increasingly imaginative rewards, both virtual and physical. A testament to the proliferation of digital content is the fact that one has to pay $100 for an “old school” boxed edition of the game. Oh how old I feel now, as I sit here with boxed games sitting on a shelf behind me , which I bought in an actual shop, a real physical shop. It is bright of the designers to come up with this attempt to fund the project, but quite difficult to grasp the sanity of a person willing to donate $5000 for the honour of being named King (or Queen) of the World in the credits of the game. 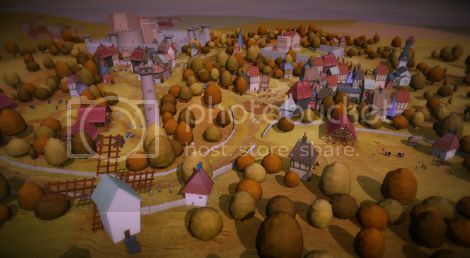 Money matters aside, the game itself is an enjoyable and quirky jaunt into a well-crafted cardboard cut-out style world with a distinctively old England feel. Loose ties to European medieval history have the player travel through Tudor-style towns, using cannons and scary farming contraptions and infecting the world populated by villagers, soldiers and noblemen with a (the) plague. Once infected, the aforementioned NPCs become controllable by the player and are added to his/her army. Each type of unit has distinct strengths and weaknesses and can be used to infect more NPCs replenishing any of the player’s forces killed in battle. Obstacles and barricades mean that the player has to seek out cannon and farming machines to aid in his push towards the ultimate goal, the nobleman. 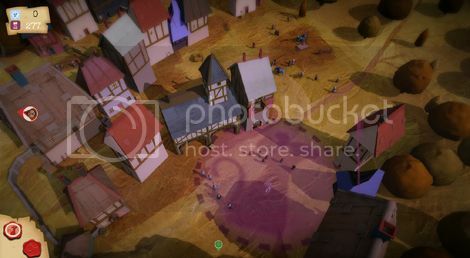 Special abilities available in the alpha version include plague-ridden rats and exploding infected pigeons which can be brought down on unsuspecting villagers aiding the all-powerful player. The early signs show that the design team paid a lot of attention to detail. For example one can only use the “Plague Rats” ability near town structures from which the rats emerge. Try to use it in a field and nothing happens. The unusual control system has the player draw colourful paths for his infected minions to travel along. Different types of unit have a unique colour making the controls pretty and fun. The alpha test version presented a number of bugs where units would become trapped behind objects and unable to ‘stick’ to machines they are pushing sometimes walking in front of them with amusingly gruesome consequences - but it's not the finished product, so these things are to be expected. The control method seems to lend itself to touch screen devices, and announcements made in February show that Ambient Studios tested early iPad and multiplayer versions. It is possible to glimpse the infant stage of a game which will be easy to start playing but will become addictive and hide some depth and complexity beneath a clean and simple façade. For now, the one question to which an answer eludes me will have to remain unanswered; Is the player controlled horde made up of the living infected with a terrible disease or reanimated corpses of those killed by a terrible disease? I look forward to finding out. The full game is due for release in November 2013, but you can download the alpha code from Death Inc.'s official website and start playing now.